Back to work - Stop staring and start sewing! Well I've enjoyed my 15 minutes of fame. Thank you all for the sweet comments, it wouldn't be half as fun if I had to celebrate alone. 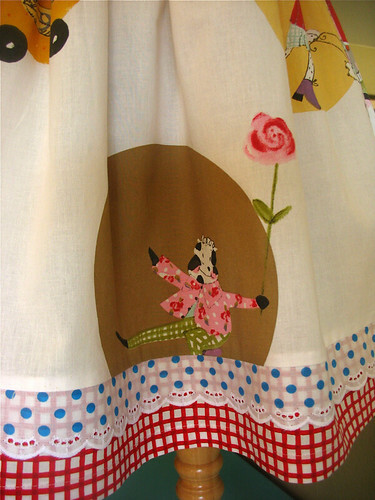 But now I need to cease my princess-waving and get back to sewing. I decided to finally try out this pattern that I've had for a long time. It's darn cute and very easy. Unfortunately it's out of print so if you like it you may have to go to the Simplicity site to get it (fortunately it's pretty cheap too). I thought I'd try some of my slower moving fabric because it drives me nuts to see it just sitting there with the plastic wrap still on it. I think I may have to take my own pictures of the fabric because the more I look at it the pictures in my etsy store, the more funny the colors look on the pictures I downloaded from the manufacturer. 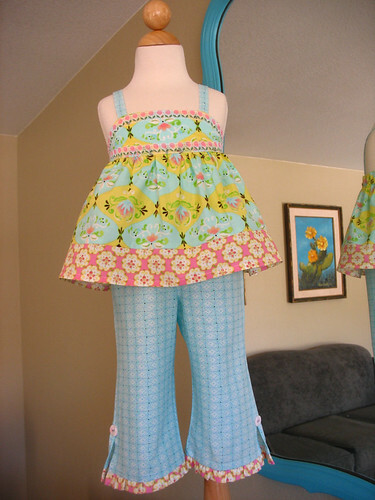 But anyway, these Sun Drop prints by Dena Fishbein were beckoning and I love the springy way this outfit came out! Isn't it sweet? I think I'll use the blouse pattern with a twirl skirt next just for fun (oh, and money!). I really had a lot of fun making this next dress though. I saw this fabric and my heart skipped a beat. I will reward my blog readers with another super secret source on this one (remember, my blog is like Vegas. What happens here stays here). This is my own pattern and it's actually very simple because I just finish the front and back separately and then stitch them together down the sides and hem it. I thought it looked like a party dress so I added the bows to make it more festive. Really fun! 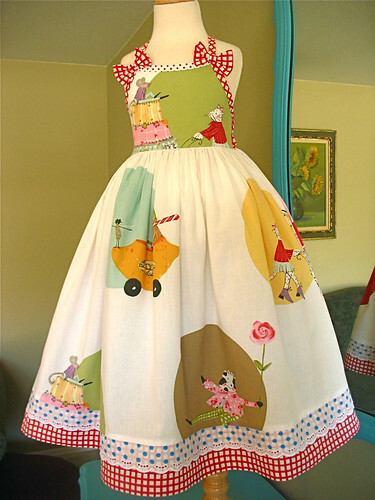 My 16 year old daughter wants me to make a dress for her from this pattern so I think that's a good measure of it's cuteness maybe. I love this cow and I finally got to use a little more of my fun stash of trims. I love this blue polka dotted eyelet! "Fabulous" is a good word for it I think. Now I better get cracking on some Easter clothes for my family or I'll never get over the guilt (they'll make sure of it! ).